Should I try Reformer Pilates? – What does it involve? Reformer Pilates and Mat Pilates are two styles of Pilates that have seen a real growth of interest. But there are many other styles there too, including classical, clinical and contemporary. The surge in popularity of Pilates developed during the 1990s. According to a Newsweek article from the year 2000, participation grew from roughly 5,000 in 1990 to 5 million a decade later. (And that was in the US alone). Of course, celebrity involvement always peaks interest and the likes of Julia Roberts, Sharon Stone and Madonna had all given it a try. However, almost two decades later and Pilates is still very much on the radar, and its enduring popularity supersedes celebrity! We take a look at the two most popular classes and see how they can benefit you. 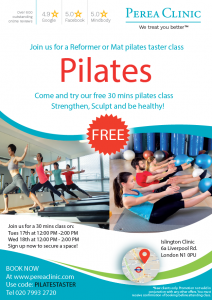 Reformer Pilates – what is it all about? Reformer Pilates is growing in popularity. Recently we discussed Pilates in general and explained that there are two main types. There is the Pilates that is performed only on a mat, but there is also a version that involves the use of specialist equipment and machines. The name of one of these specialised machines is the reformer. The history of the modern day reformer is an unusual one. The basic idea was developed a hundred years ago during World War 1. It was developed to help injured soldiers to exercise and build strength and flexibility whilst they were still bed bound. But today, the modern machines are incredibly well designed.